TRAVERSE CITY: Chateau Grand Traverse was awarded two “Double Gold Medals” as well as two “Gold Medals” for its wines at the recent 2015 San Francisco Chronicle Wine Competition. These notable awards are among a total of eight medals garnered by the winery at the largest competition of American wines in the world. Currently in its 41st year of winemaking on Old Mission Peninsula, Chateau Grand Traverse (CGT) is delighted to receive these awards. CGT President Eddie O’Keefe is very enthusiastic about the continued advancement of Michigan as an emerging national and international wine growing and producing region. “Although we do not rely upon awards as the only indicator of our wine quality, these special achievements do help us effectively communicate our winery commitment and style to our consumers,” O’Keefe said upon receiving the good news. The winery’s 2013 Etcetera White Blend was among the “Double Gold” winners at the competition. 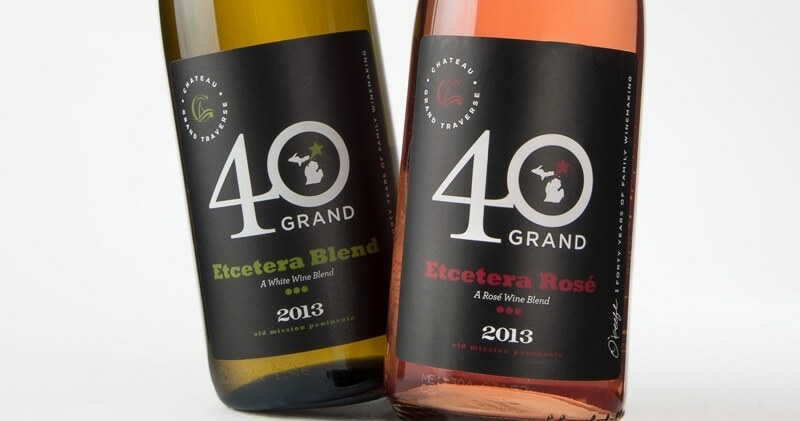 Etcetera White is a limited edition wine produced in celebration of Chateau Grand Traverse’s 40th Anniversary in 2014. With crisp-lemony style, off-dry sweetness, and vibrant fruit flavors, the wine seeks to embody 40 years of planting, growing, harvesting, pressing, tasting, enjoying… Etcetera. In addition to the Etcetera White Blend, CGT produced a “sister” wine, Etcetera Rosé, which is also showing well in national competitions. “We had some fun creating small production wine blends to commemorate our 40th year in business. It’s exciting to see these wine creations winning Gold in national competitions,” O’Keefe added. In November of 2014, Chateau Grand Traverse won the three awards at the Jefferson Cup International Wine Competition, including a ‘Medal of American Excellence’ (equivalent to a Gold medal) for their 2013 Etcetera Rosé. Receiving awards for both limited edition anniversary wines is another reassurance that 40 years of growing and producing wine on Old Mission Peninsula is drawing national attention to the Grand Traverse wine region. Chateau Grand Traverse is a family owned and operated winery, producing world-class wines on Old Mission Peninsula for forty years. The winery focuses on producing wines from European Vinifera grape varietals with the utmost quality, consistency, and environmental sustainability. Visit the winery for a complimentary tour of the winery, and taste our regionally distinctive, award-winning wines. Complete results from the 2015 San Francisco Chronicle Wine Competition can be found at www.winecompetitions.com.